RingCentral offers business phone service solutions to solo entrepreneurs and small business owners with a team. It's low-cost and can scale as your business grows. It seamlessly integrates with G Suite, Office 365, and other business tools. 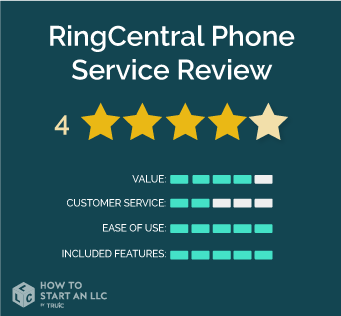 Read our full review below to find out if Ring Central and their business phone services are right for you. RingCentral offers a high quality phone service available on all devices such as mobile and desktop devices with apps, and desk phone, and is paid for on a per-user basis. Out of competitors such as Kixie and Nextiva, RingCentral stands out as a great integrator with other business tools such as Google’s G Suite, Office 365, Box, Dropbox, Zendesk, and many others. Ringcentral also stands out as a low cost competitor for small teams with their Essentials package which starts at $19.99/user/month for up to 10 users, and gives all but the most advanced features like multi-level auto attendant, faxing, recording and reporting for a very reasonable cost. What makes RingCentral the right choice? With all of these features on even the most basic plans, RingCentral has a robust set of features to get an entrepreneur, or small team started with calling. Easy to set up phone system with desktop, desk phone, and mobile app access. The quality of RingCentral’s customer service has declined over the past few years, including call center support in foreign countries and long wait times for billing and other issues. RingCentral is on the expensive side relative to other services. However, this is balanced out with unlimited minutes for phone calls from non-toll-free numbers. Nextiva is a tool best suited for a small or growing team that wants best-in-class support and account management, that becomes more affordable as the team grows in size. RingCentral offers multiple pricing tiers, from an entry-level plan for teams just getting started with phone systems to one suited for enterprise-sized companies. From Essentials, which is the core set of phone features for up to 10 users, to Ultimate, a fully-featured package for major corporations. Take a look below for the core set of calling features, and how each package beyond this adds features such as automated systems, internet fax, call recording, and more. Team collaboration: file sharing, instant messaging, chat rooms, etc. The Essentials plan is best suited for a single person, or a small team who just needs an inexpensive, simple phone system with dedicated phone numbers and some other nice-to-have features like video/screen share conference calling and online voicemail management. Standard is the first plan that allows for unlimited users, and starts at $34.99/user a month, if paid annually, for a single user. Pricing per user falls after this and depends on the number of users and if it is paid monthly or annually. If you have a phone wielding team larger than 10 people, or if you want to create an automated menu system, then the Standard RingCentral service is what you’ll need. RingCentral’s Premium offering is best for more established companies who have needs in call recording for more established sales or customer support teams, or who wish to connect RingCentral with other software systems. If you need many more toll-free minutes and the ability to receive transcribed voicemails as text messages, then the Ultimate plan is great for your team. While the features of RingCentral offer a great, easy-to-setup and intuitive phone service, the lack of good customer service takes away from the overall value of RingCentral. Generally, issues take a long time to get resolved, resulting in headaches for users. RingCentral’s customer service ratings have declined over the past few years, with many of their support centers moving to foreign countries. Former users of RingCentral have repeatedly complained that it took several months and multiples attempts before their accounts were actually canceled. For example, our team was given an extended trial by a sales representative, but was charged at the original end date of that trial, an experience echoed by a user on another review site. When attempting to cancel our account, we were placed on a 45 minute hold, but did indeed get the account cancelled. Setting up a free trial is easy. This can give you and your team a good idea of how RingCentral works at the price tier you’re looking to use. After this, maintaining the system is easy once you get used to the platform. From a basic phone system with solid online management features to fully-integrated, automated, and connected solutions, RingCentral offers great features and a reliable service. You want a system as simple or complex as you need it to be, across all the devices you use on a daily basis. You would like online access to managing your account, including voicemail and team collaboration. In addition to phone service, you’d like access to video/screen share teleconferencing. You’re okay dealing with a customer service system that requires patience.